Russian painter, affiliated with the school of Paris, born in Vitebsk on July 7, 1887 and died in Saint-Paul-de-Vence in 1985. Self portrait (oil on canvas, 1907-1909). Eldest son of a Jewish family of nine children, attends primary school for some time. Finished his studies to enter, in 1907, in the workshop of the painter Yehuda Pen, where he/she studied for a couple of months. He/She works as an apprentice Retoucher in the establishment of a local photographer. Hate this work, but moved to Petersburgo, you have to do it to survive, because his situation borders on the misery. In 1908, thanks to the support of backers Goldberg, it entered the Imperial Academy of fine arts. His work called the attention of the director of the school which gets you the exemption from military service and provides you with a scholarship. Not content with the spirit that reigns in the Academy, it is admitted in the Zwanseva school. This time, 1910, include works such as the wedding, death and peasant eating. In 1912, he/she moved to Paris with a scholarship. Attends various academies and settles in La Ruche, a set of wretches workshops where artists come from all over the world take refuge: Léger, Henri Laurens, Archipenko, Modigliani, Soutine, etc. In this environment he/she painted his first important picture: to Russia, to asses and others (1912). Meet Cendrars, Max Jacob, André Salmon and Guillaume Apollinaire. Exhibition at the Salon des indépendants in 1911. Meet Albert Gleizes, Metzinger, Delaunay and Duchamp-Villonsculptures especially impress you. It also takes part in the Salon d'Automne. His first individual is in Berlin, in the Gallery Der Sturm, in 1914. He returned to Russia shortly before the outbreak of the world war, for a short visit. Not being able to return to Paris, he/she stays in Vitebsk and marries Bella Rosenfeld in 1915. At this time painted pictures as the birthday (1915) or above Vitebsk (1914), referring to his own world. Meet the Russian poets and in 1916 made a solo exhibition in the Jack of diamonds in Moscow. Birthday (oil on cardboard, 1915). Museum of modern art (New York). In 1917 he/she made some illustrations and explodes the October revolution. Opens a school of fine arts in Vitebsk and Chagall was appointed its director. On the occasion of the first anniversary of the revolution, Chagall mobilizes all the artists of the city to adorn it in an extraordinary way. In 1918 he/she exhibits in the Palacio de winter of Leningrad and the State buys twelve works. 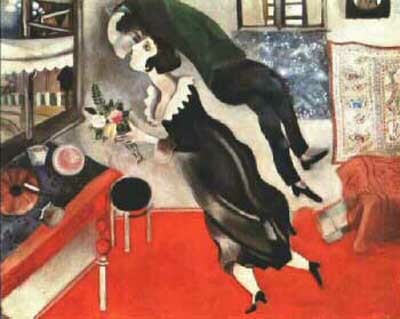 In 1919 Chagall resigns from his post as director of the school and moved to Moscow. Performs numerous mock-ups for scenery and run large paintings for the Jewish Theatre Kameny. In 1921 he/she began his autobiography my life and the next year has the opportunity to leave Russia, remaining in Berlin until autumn of 1923. There he/she began to work prints and lithographs. Back at last Paris, Vollard commissioned by (his dealer) illustrated in etching various works. In 1924 he/she meets André Malraux who maintained a great friendship. In 1926 he/she exhibited for the first time in United States at the Reinhardt Gallery in New York. The following year, it addresses the issue of the circus and three years after Vollard commissioned the illustration of the Bible, which will be the germ of the huge production that this issue will run throughout his life. For this purpose he/she travels by Israel. 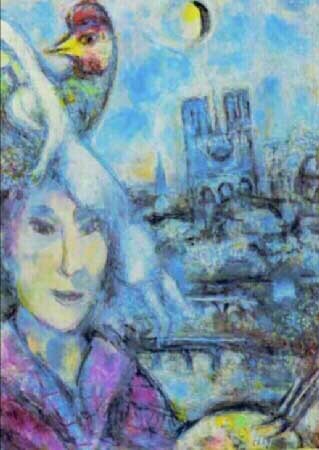 In 1936 the nazi regime made to withdraw their works from the museums; Chagall acquires French nationality and goes to live in Provence. You receive an invitation from the Museum of modern art in New York, moved to the United States, which reached in 1941. Meet Pierre Matisse, who becomes his dealer and presents a retrospective of his work in his gallery. He/She travelled to Mexico in 1942 to make costumes and decorations of the Ballet Aleko, with music by Tchaikovskyand theme of Pushkin. During 1943, painted several works that make it until that point the war that destroys Europe is a nightmare: war, obsession, and the yellow crucifixion. His wife died in 1944 and, after months of gloom, takes up his work with two paintings that are excited to tribute to his dead wife: in turning to it and the lights of the marriage. Make costumes and sets for the fire bird of Stravinsky. In 1946 the Museum of modern art in New York organised its first major American retrospective. In 1947, the Museum of modern art in Paris is reopened, after the German occupation, with a retrospective of his work. In 1948 he/she returned definitely to the South of France and meets Aimé Maeght which becomes his French art dealer; in that same year he/she participated in the XXV Biennale of Venice, getting the great prize of engraving. During 1949 executes its first ceramics, which leads finally to deal with the sculpture. It attends to Matisse and Picasso. In 1952 he/she married Vava Brodsky. He/She paints the biblical message, the ceiling of the Paris Opera House and made stained glass windows for several cathedrals. Rushing the illustration of Daphnis and Cloe's Longo, with lithographs in color. For Vava (gouache on paper, 1955). Collection of Madame V. Chagall. 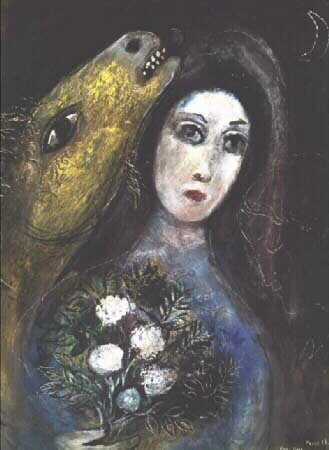 In 1955 he/she began the series of paintings of the biblical message, which will conclude in 1966, and seven years later will be installed at the National Museum of the biblical message Marc Chagall in Nice. In 1957, his recorded work is exhibited in the National Library of Paris and performs his first mosaic mural. From 1959 occur constantly facts that show the public recognition of their work and result of his tireless artistic activity, are numerous murals, large mosaics, works designed to decorate the new Parliament Jerusalem, stained-glass windows for buildings religious and civil, large number of illustrations in graphic art, scenography for theatre and large sized pictures. For all his maturity traveling very often but its study is always installed in the South of France. In 1973 he/she traveled to Moscow and Leningrad, invited by the Minister of culture of the USSR. The Soviet Government organizes an exhibition of his work at the Tetriakov Gallery in Moscow. In this same year, he/she inaugurated his Museum in Nice, through which donates a significant part of his work to the French national heritage. He/She died on March 28, 1985 at his home in Saint-Paul-de-Vence. http://www2.iinet.com/art/artists/artists1.htm: 55 works of the artist. SORLIER, Charles. Chagall by Chagall, New York, Abrams, 1979.